Gallery25N is an online gallery for exhibiting fine art. 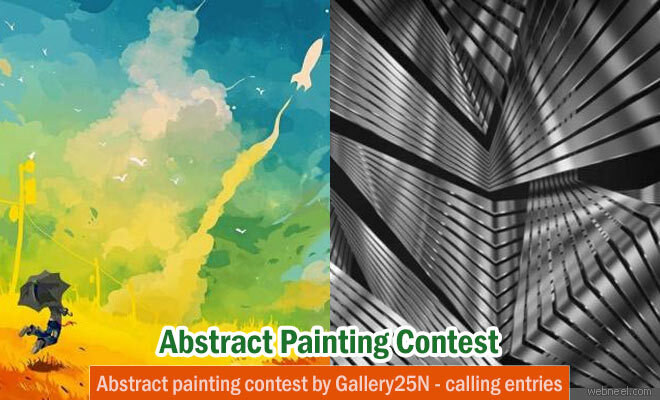 They have called for entries in the theme 'Abstract 3'. During this group exhibition, the artists can submit any number of entries after paying a nominal fee. A group of established judges will select the artworks from 20 artists. According to artcompetition.net/,"The artwork should stick to the theme and it should not have any links to the real world. The composition elements and aesthetic principles of the work must rely on form, color, action, lines, marks, texture, etc. to create a purely abstract work of art to engage the viewer and draw them into the intention of the artwork. Gallery25N and artcompetition.net/ have partnered together to conduct contests on a regular basis, so artists can benefit from showcasing their exhibits to a much larger audience globally. This contest is open for all artists/photographers who are 18 years of age or older. Fine art entries must be any still medium such as: paint, drawing, photography, sculpture, installation, digital, collage, fiber art, etc. Entry Fee: $25 for up to 3 entries and $5 for each additional image. Visit Gallery25N: www.gallery25n.com/. Your exhibits will be displayed here. Winners will receive cash prizes either through paypal or cheque within 14 days of winners announcements. Video of 'Dreams 2' artwork by 18 international artists exhibited at Gallery25N.